Going through a break-up, especially with a long-term partner, can be a traumatic and deeply sad experience. Break-ups, separations, and divorces can feel as severe as experiencing the death of a loved one. When you experience a deep and profound loss, it is important to allow yourself time to grieve and process the loss in order to heal. It is necessary to allow yourself time and space to not only grieve the relationship and the loss of your partner, but also to take the time to reflect on the relationship and learn and grow from it. When people do not take the time to grieve their past relationship, old and unhealthy relationship patterns can show up in future relationships and even affect one’s mental health. As a marriage and family therapist who works with individuals and couples, I often see individuals who are attending counseling to seek support after a break-up or want to learn how to change unhealthy relationship patterns. The period that people take between relationships is vital to your mental health and overall well-being in terms of learning from your past relationships as well as learning more about yourself and your own resilience and strength. I often work with individuals who have developed a pattern of going from relationship to relationship without much time in-between, or what our culture calls a “serial monogamist.” Often, what a therapist will encounter with clients such as these is uncertainty in what they need in a partner and in a relationship. They may find themselves having difficulty voicing their needs, sticking to a boundary, or wind up taking a back seat in decisions in their relationships. I will hear clients describe “falling into” relationships in regards to times they enter relationships because another person is pursuing them and it seems easier than being single. In the long-term, this dynamic can be detrimental to a relationship because this person may realize they’re deep into a relationship they’re not happy in and fear it’s “too late” to leave. Another unhealthy pattern that may emerge when one jumps from relationship to relationship is bringing anger and resentment (or what our culture calls “baggage”) from a past relationship into a new one. If you are seeking validation from your new partner about issues from a past partner, you are setting yourself up for an unhealthy relationship dynamic and, potentially, mental health issues. When you enter a new relationship before you’ve healed and processed your last relationship, often times you end up subconsciously punishing your new partner for issues from your past relationship. While new relationships must build trust and a new partner needs to show that he or she is trustworthy, it is unfair to put blame on this person for issues from former relationships. 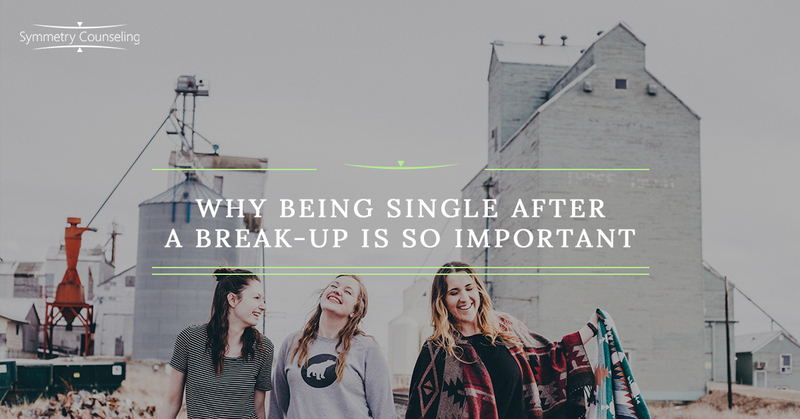 While it may feel scary, uncomfortable, and sad to spend time being single and taking care of yourself on your own, it is necessary for personal growth and for learning what you are looking for in a partner. Time and reflection are also necessary for learning what boundaries or “non-negotiables” you have in a relationship as well as growing your voice as an individual and a partner to express your needs, expectations, and desires. It is not just time that heals old relationship wounds, it must be time that is intentional and reflective. If you are having difficulty healing from a past relationship or have had a pattern of hopping from relationship to relationship, it may be helpful to consult an individual psychologist or therapist to learn about your relationship patterns and explore your individual voice. Contact Symmetry Counseling to learn more about our talented therapists to begin your therapy process.